What is Port Timing diagram in Two-stroke Engines? In the previous articles, we have discussed the 2 stroke petrol engine working principle. But now we are going to discuss the port opening and closing timings in the 2 stroke engine by drawing a Port Timing diagram. In two-stroke engines, the Thermodynamic cycle will be completed within the one revolution of the crankshaft. Two Stroke Engine uses ports rather than the valves. Port: Fluid can be operated inward and outward. Valve: The fluid can be operated in one direction only. The above processes will be operated with the sequence of operations of ports in the 2 stroke engine. This can be represented on a circle. This is called the Port Timing Diagram. This Port Timing diagram will illustrate how the events such as the Inlet port, Exhaust port and Transfer ports are open and closes. See the below Port Timing Diagram for the Two-stroke Engine. 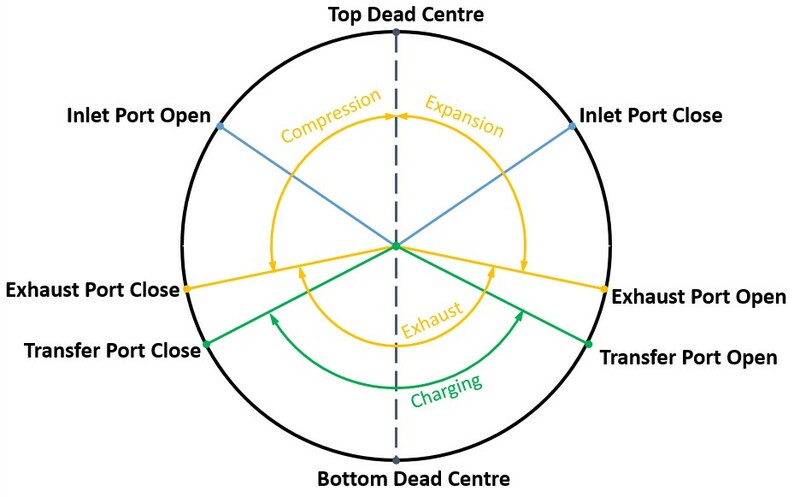 When the engine piston moves upside, which means it moves from the bottom dead centre (BDC) to top dead centre (TDC), the transfer port will be closed after 60° angle and the exhaust port will be closed after 70° from the bottom dead centre (BDC). And the inlet port will open at 50° before reaching to the Top Dead Centre (TDC). In this inlet port opening duration, the charge will be drawn into the crankcase and the charge in the cylinder will be compressed. Now the ignition will take place 20° before the piston reached to the Top Dead Center (TDC). When the engine piston reaches the Top Dead Centre (TDC) and starts moves from the top dead centre (TDC) to bottom dead centre (BDC). This is the expansion stroke due to the combustion of the air-fuel mixture due to the spark. The Inlet Port closes after 50° from the Top Dead Centre (TDC). which means enough charge will be drawn into the crankcase. The Exhaust port will be opened 70° before reaching to the Bottom Dead Centre (BDC). The combustion particles will be pushed out of the cylinder. Right after the opening of the exhaust port opening, the transfer port will also open within 10° angle. Now the fresh charge will be charged into the cylinder. So this fresh charge will also push the remaining combustion particles from the cylinder. The piston reaches the Bottom Dead centre (BDC). With this action, the cycle completes within the one revolution of crank and cycle repeats again. This is the theoretical port timing diagram for the 2 stroke engine. But the actual diagram will vary with the engine design and the specification. 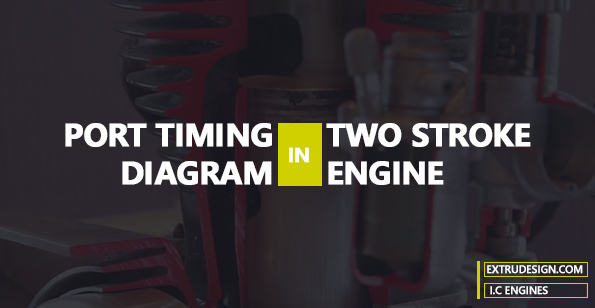 A well-tuned port timing diagram will result in the better performance of the engine. similarly, if the engine port timing is not set correctly there is a chance of leaking the fresh charge out of the cylinder. this will lead to the bad performance of the engine. Please let us know your thought in the comment section below.